Never before have I seen more references to Black Friday… and Cyber Monday… weeks before the “official” ones that fall after Thanksgiving. My inbox has been flooded with them; it’s actually getting a bit comical. Retailers sure know how to jump on a bandwagon all at once. Amidst all that conspicuous consumption, it’s nice to take a moment to reflect on the true meaning of the season, to reflect and meditate in a non-material realm. One of the most spiritual places in the Lowcountry is a bit north of Charleston, near the town of Monck’s Corner (though it’s definitely out in the country). I’m talking about Mepkin Abbey, a Trappist monastery on the banks of the Cooper River. It’s located at 1098 Mepkin Abbey Road in Monck’s Corner, a doable drive from all our SC vacation rentals, be they Isle of Palms vacation rentals or Folly Beach rentals Charleston. They are an especially scenic drive from a luxury house on Isle of Palms if you take the back way via Highway 41. It’s even quicker than going the interstate, and it’s a lovely drive. Every time I’ve been to Mepkin Abbey, I’ve come away feeling a special kind of peace that’s hard to describe. It’s a peace that passes all understanding. The monks have the gift of hospitality, and they welcome visitors for the day, or for a weekend or weeklong retreat. The Abbey has a wonderful chapel (their services start at 3:00 a.m.) and library. The grounds and gardens are gorgeous. The famed publisher Henry Luce and his wife Clare Boothe Luce bought the land, which was originally the home ofHenry Laurens, who succeeded John Hancock as president of the Continental Congress. The Luces and Laurens are all buried on the grounds. In 1949, the Luces gave much of the land to 29 monks from Gethsemani Abbey in Kentucky, who then established Mepkin Abbey on the land. They live a life of simplicity, work and charity. For years the brothers earned their living by raising wonderful fresh eggs, which they sold in area grocery stores and to local restaurants. Due to an unfair and unethical smear campaign by some zealots at PETA, they were forced to close their egg production. Now they earn money by raising gourmetmushrooms (shiitake and oyster) which are sold in local stores and served by the best restaurants in Charleston. You can find them in Bi-Lo, just over the Connector from our Isle of Palms luxury rentals, as well as in Whole Foods. Mepkin Abbey hosts numerous special events, including concerts and performances during the Spoleto Festival. What’s come to be their best known and most beloved event, however, is their annual Crèche Festival, going on now. 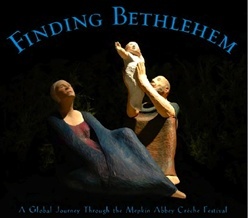 Mepkin has a collection of more than 800 crèches, or nativity scenes, and each year around Thanksgiving and the beginning of Advent, they display a large number of them to the public. The manger scenes come in all shapes and sizes, in all different media, from countries and cultures across the globe. Over 80 volunteers help with the festival, transforming the library into a forest-like setting that makes an enchanting backdrop for the nativities. This year there is also a special bonus exhibit of wise men, or magi. Several other mangers are situated outside on the grounds. This is the 12th installment of the festival, and what began with 1,500 visitors is now expected to host 7,000. There is no charge, although donations are welcome to help them expand the collection. You must, however, make a reservation, which can be booked online. A few slots remain, but you’d better move fast. Tours are every half hour during the day from now until November 23rd, and from November 28th through December 6th. If you’re coming to a Charleston beach house during those dates, this is a wholesome, meaningful thing to experience. Mepkin also has a terrific gift shop on site, where you can buy nativity scenes, fresh mushrooms, mushroom compost (like gold for the gardener on your list), Christmas gifts, books, artwork and gourmet products from other monasteries. If you’re staying in a beach house Charleston, it’s a great place to do some Christmas shopping or find something to bring as a memento for friends back home. The photo at the top of this blog is the cover of a book Mepkin published on the 10th anniversary of the festival, which has many wonderful photos from their collection. (Photo credit: Mepkin Abbey). It’s also available in the gift shop. The holidays are a popular time for rental homes South Carolina, especially beach house rentals Charleston SC. If you haven’t already booked one, you’d better hurry and give EP a call – we’ve got the best in luxury beach house rentals SC.